On your arrival in Chennai, you will be transferred to Mammallapuram. Check in at the hotel once you are in Mammallapuram. At the hotel you will be received in a traditional Indian manner; with garland and a welcome drink. After breakfast, depart for sightseeing covering Shore Temple, Arjuna’s Penance & Five Rathas. Then after lunch, drive to Kanchipuram, the golden city of thousand temples, one of Hinduism’s seven most sacred cities of the early Chola Period of the 2nd century. After the visit, drive back to Mammallapuram for overnight stay. Today, you will be taken to Pondicherry at a distance of 132km. On reaching Pondicherry, embark on half day city tour to Aurobindo Ashram; you will be transported to a world of bliss and peace. Here the day starts with meditation and visitors are allowed to take a look of Sri Aurobindo and his chief disciple Mother’s room. You will also visit the Pondicherry Museum where among the artifacts you will see the discoveries of Arikamedu, Chola bronze items. You will spend the night at Pondicherry. In the afternoon proceed for a half-day city tour. Overnight at the hotel in Pondicherry. Proceed to Chennai in the morning. You will be transferred to the airport. Board the flight bound for Madurai. Upon arrival in Madurai, you will be transferred to your hotel. After breakfast, take a sightseeing tour of the city visiting Meenakshi Sundareshwar, one of the largest temple complexes in India built between the 16th and 18th centuries. Apart from the estimated 33 million sculptures there, the temple is absolutely absorbing with the endless rounds of ceremonies, prostration of countless devotees and glittering market stalls. Later, visit Tiruparankundram Murugan Temple and Palamuthirsolai Murugan Temple. Overnight at Madurai. After breakfast, leave for Kovalam (drive). Upon arrival in Kovalam, check in at your hotel. Overnight at the hotel. Day is at leisure. Overnight at the hotel. Full day is at leisure; enjoy the facilities at the resort. Dinner and overnight stay at the resort. Check out at 12 00 noon and proceed to Alleppey. Check in at the resort in the afternoon. Overnight stay at the hotel/resort in Alleppey. After breakfast you will be transferred to the Jetty to board the House boat. Cruise through the backwaters of Kerala; enroute you will see traditional Kerala village life remaining unchanged as was for many years. You will also witness the merchants selling vegetables in a boat while the village people wait at the banks of the Vembanad Lake. Here your crew will prepare delicious Keralian meals made from freshly bought vegetables from the market. Overnight stay at Houseboat. Upon arrival in Kumarakom, check in at your pre booked hotel. Kumarakom – for the nature-lover. Here in this backwater town, you can laze in a canoe amidst sylvan surroundings where the only presence is yours and the egrets. Later visit the Kumarakom Bird Sanctuary, located on the banks of the Vembanad Lake; where numerous species of birds including Darters, Bitterns, Brahminy kites, Marsh Harries, Teals and several varieties of Herons roost are found. For an avid bird watcher, it is always advisable to carry your binoculars along. Return to the hotel; make sure you do not miss out on Karimeen and fresh toddy, the favourite fresh water food and the local wine. Overnight stay at Kumarakom. After breakfast leave for Periyar (Thekkady); one of the most fascinating wild life sanctuaries in India, noted for elephants and scenic beauty. Upon arrival in Periyar, check in at your pre booked hotel. After breakfast, visit the Periyar Wildlife Sanctuary- one of India’s biggest wildlife sanctuaries covering 777 sq. Km (300 Sq. miles) .It is a Tiger Reserve with the centerpiece being the man-made Periyar Lake at a height of 2000 ft. covering 26 sq. km and flowing through the forests of the Western Ghats in Kerala. Animals found here include elephant, sambar, gaur and wild boars. Also birds like ibis and grey heron can be seen here. If luck favours, you may be able to see the rare tigers as well. Later in the evening take a tour of the spice plantations to see crops of cardamom, cinnamon, pepper, coffee, tea estates etc. On your way back to the hotel, you could stop at the local market and pick up some fragrant spices. Overnight at Periyar. After breakfast leave for Munnar. 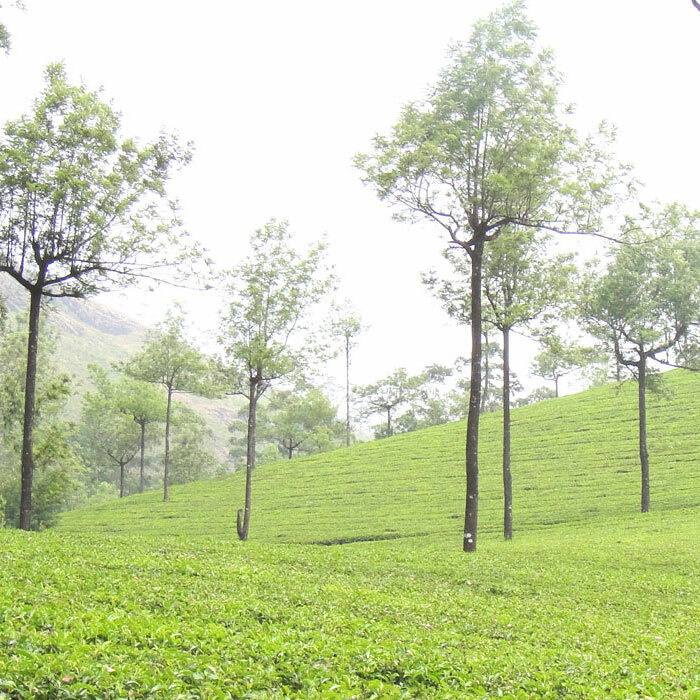 Munnar is a place of scenic beauty, surrounded by greenery and the Tea Estates. Upon arrival at Munnar check in at your pre booked Hotel. Overnight at the Hotel. After breakfast you can opt to visit Mattupetty, famous for its highly specialized dairy farm and the Indo-Swiss live stock project. Over 100 varieties of high yielding cattle are reared here. Visitors are allowed into three of the eleven cattle sheds at the farm. Follow with a visit to Pothamedu which offers an excellent view of the tea, coffee and cardamom plantations in Munnar. The rolling hills, the lush mountain and the breathtaking scenery here is ideal for trekking and long mountain walks. Later visit Devikulam (7 km from Munnar). This idyllic hill station with its velvet lawns, exotic flora and fauna and cool mountain air is a rare experience. The Sita Devi Lake with its mineral waters and picturesque surroundings is a good picnic spot. The lake is also ideal for trout fishing. Return to the hotel for overnight stay at Munnar. Optionally you can visit Eravikulam National Park (15 km from Munnar); the park is 97 sq. km, situated in the Devikulam Taluk and is home to the Nilgiri Tahr. Considering the ecological, faunal, floral, geo-morphological and zoological significance, it was declared as a National park in 1978. The park is breathtakingly beautiful and is easily comparable to the best mountain ranges found anywhere in the world. Later return to the hotel in Munnar for the night. In the evening, you can enjoy the Kathakali dance show. You will be transferred from the hotel to the airport for your onward journey.